Thank you so much for your review! Your feedback helps us continue to improve as we take on new customers and their projects. Thank you so much for your review, Kevin! We're glad to hear about your experiences with Marsh and Camellia. Thanks for your review, John! It's great to hear that you're happy with how the project turned out! Hi, Jennifer! Thank you for your review--we're glad to hear you're enjoying your completed Marsh project! I had a terrific experience with Marsh from start to finish . Carol VanZile headed up my project of Kitchen and Master Bath renovations . Myra, thank you so much for your feedback! All of us at Marsh Kitchen & Bath really appreciate you taking the time to review us, and we're happy to hear about your positive experience. Thanks so much for your feedback, Mary! 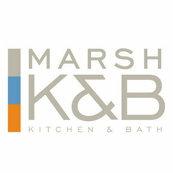 We're glad to hear that you're happy with your Marsh kitchen. Thank you for your feedback! We're glad to hear that your dream kitchen became a reality!